Secure Fisheries, a program of One Earth Future, and City University (CU) in Mogadishu have formed a partnership that will improve Somali fisheries through information sharing, joint research, and education. Marine scientists at CU and Secure Fisheries will launch research projects to collect, analyze, and present new data on the Somali marine environment and its living resources. Student-led research will be emphasized to train the next generation of Somali fishers, scientists, and policy makers. “We are excited to partner with City University to help build future fisheries managers and scientists who can support sustainable fisheries across Somalia,” said Kaija Hurlburt, Director of Secure Fisheries. The Marine Science Department of City University currently supports 172 students in its Marine and Fisheries degree and high school programs. Ten students from the university’s degree program will matriculate in the first graduating class of 2018, and 54 will graduate from the Marine and Fisheries high school. The Marine Science Department provides Somalia with a comprehensive degree program that includes a small fleet of scientific research vessels, marine vocational training facilities, computer lab, marine laboratory, desalination plant, experimental fish pond, and a fish handling and processing unit. Secure Fisheries produced the first comprehensive analysis of Somali fisheries in their 2015 report, Securing Somali Fisheries. This partnership promises to advance the state of knowledge about marine fisheries in Somalia to promote sustainability and improve fisheries governance. 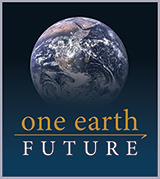 For more information please contact One Earth Future at +1 720-274-8231 or jplarroque@oneearthfuture.org. OEF is a self-funded, private operating foundation seeking to create a more peaceful world through collaborative, data-driven initiatives. We focus on enhancing maritime cooperation, creating sustainable jobs in fragile economies and our research actively contributes to thought leadership on global issues. Secure Fisheries is a program of One Earth Future and combines science-based research with a policy-oriented approach to build sustainable fishing practices, improve food and economic security, and combat illegal, unreported and unregulated fishing (IUU). Established in 2012, City University is a not-for-profit Foundation University located in Mogadishu, Somalia that is pioneering quality instruction, research, and service to society.